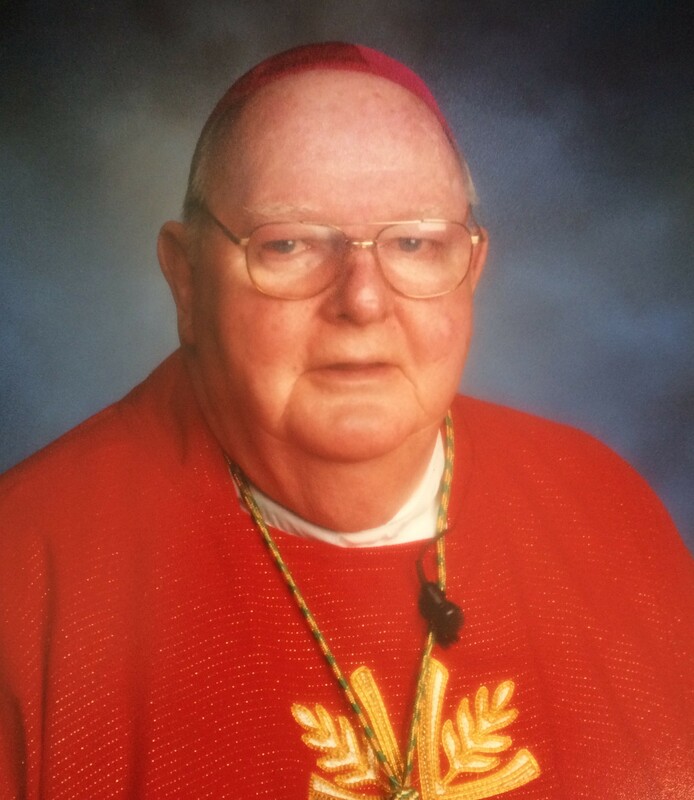 Winooski, Vermont – The Most Reverend Kenneth A. Angell, the eighth Bishop of the Roman Catholic Diocese of Burlington, age 86, died on October 4, 2016. Bishop Angell was born on August 3, 1930 in Providence, Rhode Island, the son of the late Henry and Mae (Cooney) Angell. Bishop Angell attended public and private elementary schools in Providence, Rhode Island. He attended Our Lady of Providence High School and began his seminary studies at Our Lady of Providence Seminary in Warwick, Rhode Island. For his theological studies, he attended St. Mary’s Seminary in Baltimore, Maryland. Bishop Angell was ordained to the priesthood for the Diocese of Providence by the Most Reverend Russell J. McVinney, fifth Bishop of Providence, on May 26, 1956, at the Cathedral of Saints Peter and Paul, Providence, Rhode Island. Bishop Angell began his priestly ministry in 1956 at St. Mark Parish, Jamestown, Rhode Island, and Sacred Heart Parish, Pawtucket, Rhode Island. In 1960 he served as Assistant pastor of St. Mary Parish, Newport. In 1968 he became Assistant Chancellor and Secretary to the Most Reverend Russell J. McVinney, Bishop of Providence, and in 1972 was appointed Chancellor and Secretary to the Most Reverend Louis E. Gelineau, sixth Bishop of Providence. Bishop Angell was named a Prelate of Honor with the title Monsignor by Pope Paul VI on December 17, 1972. On August 13, 1974, he was appointed by Pope Paul VI as Titular Bishop of Settimunicia and Auxiliary Bishop of Providence, and was ordained to the episcopate by Bishop Louis E. Gelineau on October 7, 1974. He then served as Vicar General of the Diocese of Providence until October 6, 1992, when he was appointed by Pope St. John Paul II as the eighth Bishop of Burlington. He was installed as the eighth Bishop of Burlington on November 9, 1992. Bishop Angell served as Diocesan Bishop of the Diocese of Burlington throughout the rest of the 1990’s and into the new millennium. He exhibited a shepherd’s heart in his care for all the people of Vermont and lived out his episcopal motto to “serve the Lord with gladness.” After the events of September 11, 2001, in which his brother and sister-in-law lost their lives, he exhibited exceptional leadership in calling for forgiveness and mercy, as well as peace and reconciliation among all people. While Bishop of Burlington, Bishop Angell served on the Board of Trustees of Wadhams Hall Seminary and Champlain College and was active in the Vermont Ecumenical Council and Bible Society. In addition, Bishop Angell received honorary degrees from Providence College, Our Lady of Providence Seminary, Salve Regina College and St. Michael’s College. Following thirteen years of leading the Diocese of Burlington, Bishop Angell’s resignation from office was accepted by Pope Benedict XVI on November 9, 2005. During his retirement, Bishop Angell resided in Burlington, Stowe, Winooski and, most recently, at Our Lady of Providence Home in Winooski. Bishop Angell was predeceased by his parents and his brother and sister-in-law, David and Lynn Angell. He is survived by his sister Claire Miller and her husband Bernard, of Salem, NH, as well as nieces and nephews, Karen and Philip Brendli of Brewster, NY, and their children, Craig, Rebecca, Blair and her husband Samuel; Kathleen and Joseph Grinley of Salem, NH and their children Marissa and her husband Mark, Patrick and Jeffrey; Anne & David Rice of Syracuse NY, and their children Andrew, Lauren and Meredith; Stephen and Georgeann Miller of Golden Bridge, NY and their son, Gregory. He is also survived by a great-great nephew, Kenneth, and great-great niece, Abby. A Mass of Christian Burial will be celebrated on Tuesday, October 11, 2016, at 1:00 P.M., St. Joseph Co-Cathedral, Allen Street, Burlington with Bishop Christopher J. Coyne as principal celebrant. Calling hours will be on Monday, October 10, 2016, from 3:00-7:00 P.M., and on Tuesday, October 11, 2016, from 11:00 AM to 12:30 P.M., at St. Joseph Co-Cathedral. Burial will take place in the Angell Family lot at St. Anne Cemetery in Cranston, Rhode Island at a later time. Gifts in Bishop Angell’s memory made be made to the Priests Benefit Fund, 55 Joy Drive, South Burlington, Vermont 05403. Arrangements are under the care of LaVigne Funeral Home and Cremation Service.